The pro-life movement has a rich history and diversity of leaders and methods. Those who are passionate about the dignity of every human life gather together in many different ways, whether that is praying outside of abortion clinics, providing support to single mothers, or contacting legislators. Pro-life converts are from all walks of life, as demonstrated by the witnesses of former abortionist Dr. Bernard Nathanson, ex-Planned-Parenthood-worker Abby Johnson, and civil rights activist Dr. Alveda King. Increasingly, however, there has been an awareness in the pro-life community that, ultimately, we are fighting a spiritual battle, and our methods ought to reflect this reality. St. Paul tells us in the Letter to the Ephesians to “Draw your strength from the Lord and from his mighty power. Put on the armor of God so that you may be able to stand firm against the tactics of the devil. For our struggle is not with flesh and blood but with the principalities, with the powers, with the world rulers of this present darkness, with the evil spirits in the heavens” (Ephesians 6:10-12). Certainly, we need concrete action in the realm of government and the form of practical support for those facing unexpected pregnancies—these efforts are essential. But finally, our most powerful option for converting hearts and saving innocent lives is prayer. We cannot function without the work of the Holy Spirit and the intercession of the Blessed Mother and all the saints and angels fighting for this cause. 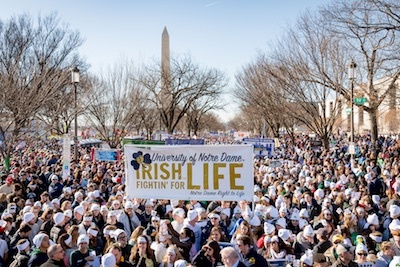 This is why Notre Dame Right to Life’s journey to the 46th annual March for Life on January 18, 2019, in Washington, D.C. will focus on a particular spiritual aspect of the trip—pilgrimage. Pilgrimage has always been an important aspect of the trip, but is receiving special emphasis this year as the club seeks to make prayer a more central aspect of its efforts. Club president Sadie Facile is looking forward to both the pilgrimage aspect of the March and this year’s theme. “I am excited that this year the march is a pilgrimage because the foundation of the pro-life movement for me is grounded in the Catholic Church,” she explained. “Our faith calls us to recognize the beginning of life at conception and this truth of the Church is enriched by science!”, she exclaimed. Because of this crucial truth, “This year the theme of the March is ‘Unique from Day One’—establishing science’s recognition of life beginning at conception,” Sadie continued. The March Team has been in contact with important sites in D.C. for deepening the participant’s faith experience, such as the Dominican House of Studies, the John Paul II National Shrine, and the Basilica of the National Shrine of the Immaculate Conception. “From the third-largest church in the world, to a shrine to one of the greatest saints of our time—we hope these opportunities will give our Marchers an opportunity to discover something new with their own relationships with Jesus,” Lindstrom explained. The March for Life Pilgrimage will be an opportunity to unite prayer with political action, and to experience personal spiritual formation. Lindstrom noted, “The true mark of the March is that it changes our own hearts for the better when we unite ourselves to an authentic and loving community.” This has been the case in the past for the March, and will hopefully be even truer this time around. The Catechism of the Catholic Church states that “pilgrimages evoke our earthly journey toward heaven” (CCC 2691). The new focus of the Notre Dame March for Life trip points to a closer union of the work of the pro-life cause with the journey of the Church on earth, which is essential as we work for the right to life and the eternal salvation of every person.